“A recent article asked ‘why isn’t there more evidence of progress for cycling under a green mayor’ ? Questions were also asked about how this all fits with transport overall. So let’s start with cycling. As WCC Transport Leader from 2007-09 I led development of the City’s first ever Walking and Cycling Policies, both adopted in November 2008. At the time the budget for cycling was a paltry $70,000. 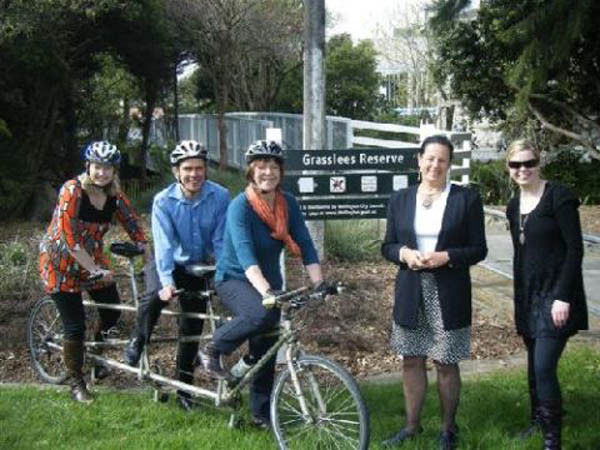 At the following (June 2009) I was successful in getting a 9-6 vote to support lifting the budget for the ‘basics’ (cycle racks, cycle friendly grates, advanced stop boxes, lane markings etc) to $225,000, and putting in funding to develop a strategic cycle network. That is now $1 million per annum. Importantly in both instances this included NZTA’s 53% contribution. That is the same as for local roading. However the first challenge was getting that NZTA funding support. In November 2008 we had just had a change of Government. Labour had said that if a project was in a Council’s properly developed and consulted on Cycling or Walking Policy then it would get funding support. National abruptly changed the rules completely, focusing very heavily on ‘Roads of National Significance’. Fully 40% of spending on transport (all modes, all roads, safety, policing, planning) over the next decade is intended by Government to be on RONS which collectively represent about 0.5% of the national network. Most other aspects of transport suffered and are going to continue to suffer, both in terms of the amount of money allocated in the Government’s Policy Statement, and also in how hard it is proving to access what funding there is. RONS projects basically automatically get funding because they are considered to have ‘high strategic fit’, regardless of whether the transport case is good, bad or indifferent. However we eventually got the money required to spend what is $1.3 million a year on cycling. 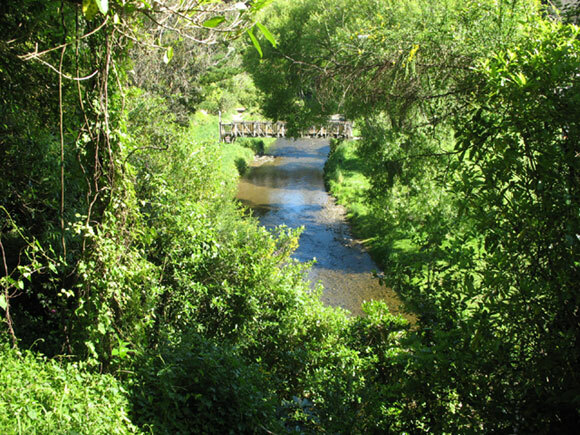 The strategic project that was ready to go was the $4 million, 5 km, Tawa – Porirua cycleway/walkway. That’s what NZTA agreed to fund, and that is what we are now well advanced in delivering. It will be finished in the next financial year (2013/14). The problem is that for most people they probably won’t see that because most of us don’t live in or cycle through Tawa/Porirua, and therefore they naturally wonder what Council is doing. Ideally what we should have done is to advance two projects simultaneously albeit slower and that is probably our mistake. What else is happening ? We’ve been installing about 30 advanced stop boxes a year at traffic lights, cycle friendly grates (to stop your wheels getting stuck if forced too close to the kerb), and cycle racks. The Mayor has been strongly advocating for the Great Harbour Way – a 70km walkway/cycleway from Pencarrow Head right round the harbour to finish at Owhiro Bay on our South Coast. WCC has closed the ‘gap’ Balaena Bay, Hutt City has been doing some good work on the Eastbourne bays route. The whole region has decided that the big gap between Petone and Ngauranga is the #2 priority for the next three years, and NZTA is working to a timetable to deliver this project in 2014-15, though I am nervous that they seem to be looking for reasons not to fund it. (apparently most road cyclists wouldn’t use a path if it was slower- we have suggested looking at the many potential cyclists, and walkers/runners who would use a safe route if one existed – the State Highway being just too dangerous) It doesn’t help that NZTA doesn’t acknowledge recreational road use which is obviously growing dramatically. We have asked the Port about land to get the Great Harbour Way along Aotea Quay, which is also proving a challenge. If built that would link up with the improved shared walkway/cycleway along Waterloo Quay to the cruise ship terminal finished last year. Celia and I have supported a regional tourism cycleway which Positively Wellington Tourism is now championing with the Hutt and Wairarapa Councils. We are quietly hopeful of an announcement soon that the route using the Hutt River Trail, Rimutaka Incline and Western Lake Road will be approved. At the second time of trying we put in a morning peak clearway on Thorndon Quay to address one of cyclists’ most dangerous – high crash rate areas in the city. (it is especially a morning peak issue). Celia and I pushed officers to allow a trial cycle route up through the Botanic Gardens (Met Office to Cable Car) which has a grunty approach but is a safe route up to the Western Suburbs. My experience is it is working very well. We also approved uphill cycling on the Birdwood St footpath into Karori, again for safety reasons. There is now signage on bus lanes (not bus only lanes please note), showing clearly that cyclists are allowed to use them. We have approved speed limit reductions through a number of suburban centres, and importantly along Oriental Parade and round the Miramar headland. Simple green paint on the Hutt Road shared path has been helpful in reducing the hazard caused by motorists crossing the path to enter business premises – altering them to the potential for cyclists to be there. In Johnsonville, the then ward councillors (Ngaire Best, Hayley Wain, Helene Ritchie) and I specifically got a paper to our Strategy and Policy Committee to better address walking and cycling issues as part of roading plans for the Johnsonville triangle associated with the planned Mall redevelopment. There have been recent improvements at Houghton Bay as part of roading changes. We should also not forget the ongoing fabulous work being done in developing off road tracks, mostly by mountain bikers, with Council support. Some of those are also excellent ways when time permits to get to and from work in a fun way and with a bit more exercise than a direct road route, as I will do going in to Council this afternoon. 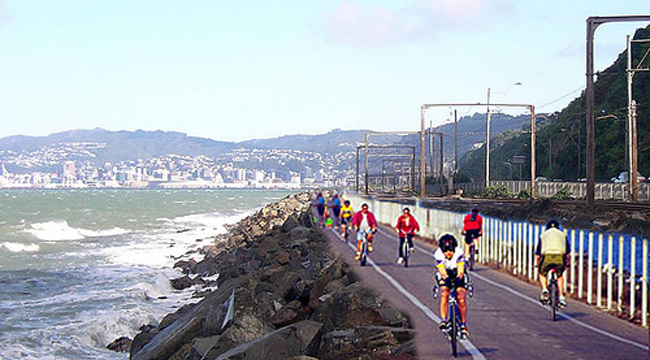 We have funded investigatory work on a new cycle route from Island Bay to the Central City. That is intended to be our next city strategic route (beginning 2014-15) after Tawa is completed. We are also looking at the sections of the Great Harbour Way from Ngauranga into the City. Further out there will need to be some thinking about the northern approach to the city along Middleton Road from where the Tawa shared path will finish. Future opportunities on the Hutt Road are intimately linked to NZTA plans to add a lane to the Motoway from Ngauranga to the Aotea offramp. Adelaide Road was mentioned by one blogger, and I agree. We have yet to make any decisions on road space allocation, but in my view safety for people travelling on the road has to rate more highly than on road parking, especially as most of those properties already have off road space. We have also last week confirmed our desire to have officers consult on lower speed limits (30 or 40 km) across the CBD area which is helpful for walkers and cyclists. I’ve also had unanimous council support for officers to work with key stakeholders to audit all those pedestrian crossing times that were also mentioned in dispatches. So, I understand people’s concern about the visibility of any changes. Yes we probably should have spread the Tawa project over a longer period to allow another project to get underway that a larger proportion of the city would have seen, but Tawa is nonetheless a very good project and we will move to other major projects shortly. It is important that we invest in all modes and that absolutely includes cycling. Wellington does not yet have an adequate, safe cycling network, and our topography and narrow streets make it challenging to deliver one. However cycling is growing rapidly in popularity, and it is really important that the City continues to deliver a better network. I think that has the potential to be quite transformative. In all this we are keen to continue to work with cyclists, pedestrians and representative groups like Cycle Action Network (CAN), Cycle Aware Wellington (CAW) and living Streets Aoteoroa (LSA). We will also need to continue to stress to Government and to NZTA how important we see this investment. I hope this gives a bit of context for what is happening, what we plan to do, and the (difficult) environment in which we operate. Note: please also see Mayor Wade-Brown’s comments under the other recent post about *$%!! @&#$ Cycleways…. Thanks Celia and Andy for the response. Re your future plans, please look again at the decision not to widen Adelaide Road. You say, “We have yet to make any decisions on road space allocation,” but the original plan to widen it that came out of the Adelaide Road Framework is an indication that road space allocation was explored and the only good outcome required widening the road. I know there were a lot of people involved in developing that plan, lots of workshops, consulting the residents and business owners, and so on. I don’t imagine the recommendation was to spend money on widening it if it could be so easily avoided. But when NZTA didn’t come through with the funding the decision was made to not widen, and just do some improvements to the street as is, despite all that work, consultation, and eventual consensus. So why is it that when we have gone through a design process such as this to reach the ideal result, we throw that away because we don’t have the money right now? Let’s slow things down. Is it unreasonable to take a long term approach, use the money intend for the streetscape improvements to secure the necessary land, while its vacent, and while it’s cheaper, then improve the street in the future when we have the money to do the job properly. As a frequent cycle commuter from Johnsonville through town, I can confirm that the cycleway markings from the foot of Ngauranga along the Hutt Road are really helpful. And the morning clearway along Thorndon Quay is an absolute godsend: at a stroke, it significantly improved the safety of what is one of Wellington’s main arterial cycling routes. Both these changes have directly improved my commute significantly. Great news that the northern and western suburbs are benefiting but what about the southern and far more important (as far as I am concerned) the east Wellington suburbs. There is still the totally horendous grate and lack of any bike stop boxes on any of the roads going into the Rongotai Road/Onepu Road intersection near Pak n Save and KFC. In fact each time the council does anything there it just makes the intersection worse. This is the most used intersection by cyclists going from Lyall Bay and back onto the Evans Bay route back into the city but there is nothing for cyclists here! Only a Pak and Save entry exit that seems to be driven into and out of by half blind motorists that can’t see high vis wearing cyclist like myself. Also at the Cobham Drive/Evans Bay intersection the council assumes everyone is going to Miramar. NO quite a few like myself are heading into Kilbirnie. What about some markings and stop boxes on this intersection? And don’t get me on to the lack of cyclist friendly fast routes around the Quays or on the waterfront. Each time there is a new addition of something lovely along the waterfront the cyclists are shafted. And it becomes more dangerous. As for the Hobbit party ….What gives blocking cycle pathways. And this happens every single event. I would cycle along the Quays if there was a safe cycle lane along these. So bite the bullet WCC and get rid of a car lane on the Quays along the waterfront and put in a decent marked wide cyclelane. Thanks Andy for this great summary of what’s being done around the city for cycling. And thanks also for your honesty about what could have been done better. The beauty of hindsight eh? Because the improvements to cycle infrastructure are so spread out around the various suburbs, I think it can be difficult for commuting cyclists, who often ride the same route every day, to really see what’s changing unless it’s part of their regular ride. So hearing about all these projects that are underway in other suburbs is excellent. It’s a clear indication that things really are changing for the good, albeit slowly, and plans are afoot that will one day lead to all of Wellington being the cycling haven we want it to be. Bring it on. Keep up the good work, and keep consulting with us cyclists so we can let you know what works and what doesn’t. We may not all be engineers, but we do have an intimate relationship with the hazards of Wellington roads, and we have some great ideas about they could be improved. Hi and thanks Erentz – I will discuss Adelaide Road space allocation with transport officers next time we meet. I have previously told them that my view is that road space needs to be allocated first to safe movement, including cyclists, and only to parking f there is space left over. There will need to be some traffic resolutions to give effect to any changes so opportunity for councillor and public input. Thanks also Eleanor. I would like to make sure that when changes are made there is some discussion with representatives from different modes just to make sure officers haven’t made avoidable errors. There will be trade offs some times, but those need to be understood. For example when the new pedestrian arrangements at Taranaki – Wakefield went in recently Cycle Aware and some individual cyclists raised concerns about the new layout being hazardous. The lane markings were quickly changed which is the right response. However ideally we should get it right in the first place. Talking to organisations like Cycle Aware, Living Streets, Go Wellington/Mana, the AA, would help. Andy – While there have been some useful developments on the cycling front, it’s disappointing to see you’re trying to claim the Walking Policy as a positive step forward … because by any reasonable measure, it’s been a complete failure at bringing any sort of improvement for pedestrians. Since the policy was introduced in 2008, practically every transport initiative in the city has worsened the pedestrian environment and quality of service. Four out of the six pedestrian crossings I regularly use have been removed; we’ve had a pedestrian mall taken away and in return got a “shared space” (aka a road with lots of parking); every single traffic light in the city remains biased against us; my personal walking commute has worsened by 15% due to the anti-pedestrian phasing on major intersections; we have suffered the indignities of being treated like cattle in Willis Street because the traffic engineers lack the ability to design a safe pedestrian environment; and we’re had to listen to Councillors tell us in the media that we need to take “personal responsibility” for the consequences of the Council’s poor design, whilst implying that all us pedestrians are idiots. So while you’re busy helping out the cyclists in the city, would it be too much to ask that the Walking Policy is actually given effect, rather than leaving it as the extended exercise in hypocrisy it currently is?